Enjoy an unforgettable vacation in our beachfront family resort in Cancun with a special discount of 46% for your next vacations. In addition, get an incredible additional benefit: The best dolphins swim experience, “Dolphin Swim Adventure for 2”, where you will have the opportunity to interact with a lovely dolphin. Get the most of this experience and have a fun time with the different activities such as kissing, hugging, handshaking and more, also, have the best ride while on his belly and go across the water while been pushed on a boogie board. With this tour package you will enjoy a full day at Isla Mujeres, including breakfast, lunch and drinks, also spend the day at a Beach Club plus other activities. During your 50-minute Dolphin Swim Program, you will bask with different activities with the dolphins such as belly ride, boogie push, kisses & hugs, hand target, handshake and more. 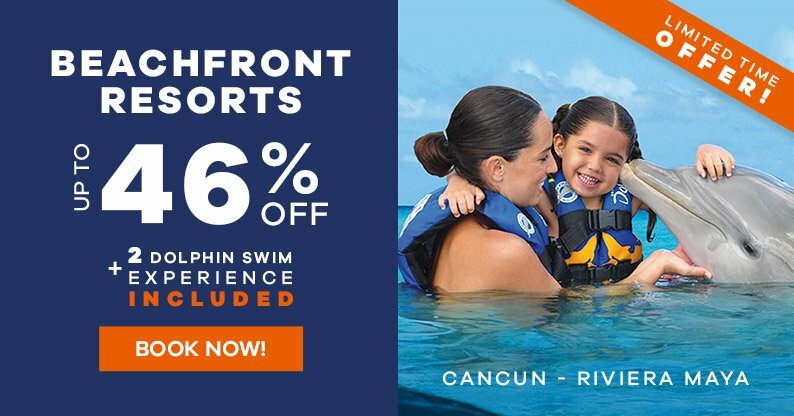 Take advantage of this deal and book now your next Cancun vacations and have a once in a lifetime experience. Swim with Dolphins Tour: 50 Min. Dolphin Swim Adventure tour for two people per reservation. Ferry Cancun - Isla Mujeres - Cancun included. Breakfast, lunch and national drinks included as well as access to the Beach Club in Isla Mujeres. For the All Inclusive at the Resort: some surcharges will apply for premium food and beverages; it is indicated on the restaurants menu. Limited Room Service menu avilable 24 hours. Children stay Free at the Resort: Children up to 12 years old can stay for free using the existing beds, there is no extra beds or rollaway beds available. *Restrictions: The minimum lenght of stay is 3 nights, however this may vary depending on the season. Does not include ground transportation or Photo Package at the Tour. NOTE:Mandatory docking fee ($10 USD) payable directly at the dock, not included in the rate. Black Out Dates: July 1st, 2019 to August 23, 2019. "We had a very good experience as we always do and Vincent, the head coinceres and all his staff were great and made us very welcome. Gave us personal attention. From the time we got there until we left we were treated very well." "Great family vacation - the layout of the apartments meant our 2 year old had her own room. Super staff (shoutout senor Hector in the restaurant!) and a real effort to maintain a friendly low key atmosphere- not a party resort at all. The main restaurant was right on the beach and we enjoyed the food. Hope to return"